Lodoss-tou Senki started as an RPG setting, which Group SNE used with rulesets such as Dungeons & Dragons, Tunnels & Trolls, and RuneQuest. Then, in 1986, they started writing up a series of replays of a Lodoss D&D campaign and publishing them in Comptiq. The popularity of the replays was such that they lead to the creation of the franchise, starting with the first novel (which would come to be considered one of the first light novels ever) and a video game in 1988 and the first RPG source book in 1989. There are now eight video games, various RPG books, radio plays, books on tape, and short stories, in addition to the anime, manga, and light novels. 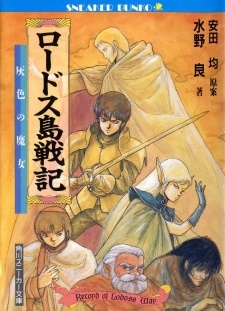 Yutaka Izubuchi's illustrations for Lodoss were also the origin of the Japanese style of elf ears. The first novel, Haiiro no Majo, was published in English as The Grey Witch by Seven Seas Entertainment on December 19, 2017. The first four novels were published in French by Calmann-Levy from February 14, 2006 to January 7, 2009. They're barely making a freaking Official english release?